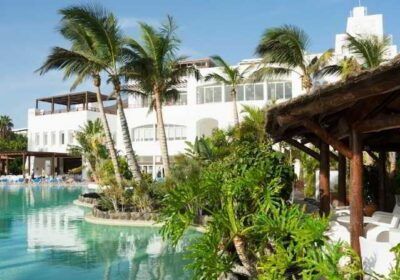 Club Jandia Princess Resort Hotel Free Child Places Jandia, Fuerteventura Low Deposit Family Holidays @ Web2travelDeals. Finding the Best Value Holidays to Jandia, Fuerteventura from UK airports. Club Jandia Princess Resort Hotel was previously called Jandia Princess Hotel. This 4 star hotel has a beautiful location on the hilltop, over looking the sea. The food is lovely in all the restaurants, with a great selection of dishes. A great choice for Family Holidays, as there is lots of space for the children to have fun. Adults can choose to to spend their time in adult areas or the adult pool. Steps down to the sandy Playa de Esquinzo beach from the hotel. 7 nts All Inclusive from £667 p.p. (£2,021 total based on family of 4 with 1 free child place) inc flights from East Midlands Dep 10 July 2019. Get More Information and claim your Free Child Place for Club Jandia Princess Resort Hotel. Club Jandia Princess Resort Hotel is located on the seafront with steps leading down to the Esquinzo beach. There is a supermarket and a bus stop nearby. There are endless shops, bars and restaurants in the resort of Jandia which is approx 5km away and the old fishing town of Morro Jable, complete with harbour, is approx 9.5km. Playa de Esquinzo is approx 77km away from Fuerteventura Airport. Club Jandia Princess Resort Hotel enjoys a relaxed beach location, adult only zones and a good range of facilities appealing to families too. Club Jandia Princess Resort Hotel is set in extensive gardens with multiple outdoor swimming pools including a heated pool for children, the main pool, 3 adult only swimming pools (one is a naturist pool) and relaxing sun terraces furnished with loungers and parasols. The wellness centre is located in the adult only area and features a fitness gym, a sauna and a Zen area. Further leisure facilities and activities include a multi-sports track, 4 tennis courts (local charge), 2 paddle tennis courts, a games room, archery, a children’s playground and a kids club playroom. The animation team organise daytime activities, evening shows and entertainment and a mini-club for children aged 4 to 12. Social and dining venues include 3 restaurants and 4 bars. The main restaurant is open for breakfast and dinner and features a family section and an adult only section. It offers varied buffets on a 14 day menu with themed dinners, show cooking, a kids buffet and a pizzeria. La Choza restaurant offers indoor and outdoor dining with ocean views from the terrace. It is open for buffet breakfasts, buffet lunches, snacks throughout the day and, in the evening, it offers A la Carte service for adults only, specialising in Mediterranean cuisine. The El Lagar restaurant is open to all (subject to reservation) for evening meals with a menu of Canarian and Spanish cuisine. Your choice of bars includes an adult only chill-out bar, an entertainment lounge, a sports bar and a disco. Amenities and services available to guests include 24 hour reception, currency exchange, restaurant high chairs and free cot hire. There is also a bazaar, WiFi hot spots, an internet corner, an on-site doctor, baby sitting, car hire and laundry services (all with local charges). There are 512 double rooms housed in ten separate buildings which are located throughout the gardens and have a maximum of 3 floors. The hotel rooms offer light accommodation and have an en-suite and a furnished balcony or terrace, mostly with sea views. Adult only rooms offer warm decor and modern furnishings and are located in the Adults Only area. Family rooms are located in the Family Princess area and comprise 2 interconnecting rooms with a king-size bed, twin beds and 2 en-suites. In general, rooms feature twin/double beds, a sofa bed for a 3rd person, satellite TV, a telephone, a mini bar, hair dryer, safe (local charge) and air conditioning. Find the Best Deals, Holidays and Fuerteventura with Web2travel.co.uk.